You'll notice this b&w image also appears within the collage version of the edition. Peter decided to publish approximately half and half of each for the edition. The total overall edition size was originally going to be 80 editions – so a 40 / 40 split between the two Clowning prints. However 15 extra editions were added to the total number, bringing the edition size up to 95. No one knows how these extra editions were split over the two images, but as an approximation there were between 40-47 of each. Obviously this only takes us up to 94, but unfortunately we have no way of finding out how these 15 were split. These days it is usually the black & white edition which appears on the market, so this is a RARE opportunity. 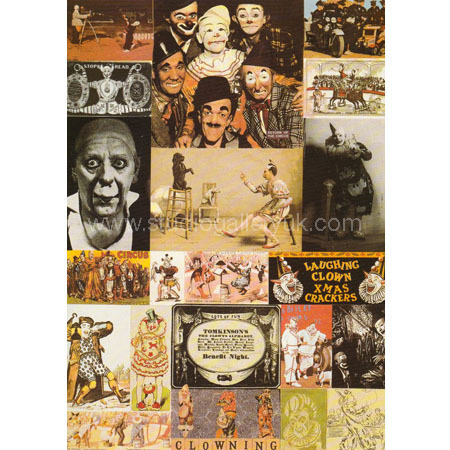 to collect the collage version of 'C is for Clowning'. 'C is for Clowning' comes from the set of x26 bold and colourful silkscreen prints, one for each letter of the alphabet, produced by the artist in 1991. Sir Peter Blake's first Alphabet Series was Published in 1991 by Waddington Graphics and Coriander Studio, London. This beautiful Silkscreen is created on wove, signed, titled and numbered in pencil by Sir Peter Blake.